The new Volvo V90 is a surefooted off-road performer. Enabling this off-roading prowess is the proprietary Instant Traction system. This service uses special sensors to keep an eye on several important performance measures that include wheel speed, engine speed, and braking force. By taking all factors into account, the Instant Traction system can provide all-wheel-drive or partial wheel drive at the proper moments. This translates into greatly enhanced traction under all driving conditions. 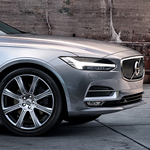 The Volvo V90 chassis system works hand-in-hand with the traction system to provide comfortable rides. Some special features of this chassis include double wishbone suspensions made of lightweight aluminum for higher performance. The rear of the suspension includes reduced weight leaf springs that provide truck-like support with minimal performance loss. These features combine to provide a higher than normal ground clearance that allows this vehicle to go yet further afield.